2. Input voltage: AC100-240V, 50/60Hz. 4. Interface Qc 3.0 output: DC3.6V-6.5V 3A, DC6.5V-9V/2A, DC9V-12V/1.5A. 5. 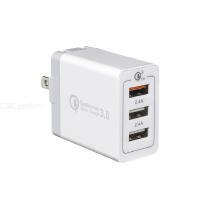 2-port USB2.0 output: 5V 2.4A Max. 6. Product features: This QC3.0 mobile phone fast charge, using fire-resistant PC material, high temperature and good quality. Multi-functional design, including a QC3.0 version of USB, a wider range of charging. The total output current is 4.8A, which can intelligently charge electronic products quickly. Suitable for all mobile phones, tablets, cameras, MP3, MP4, PSP and other digital products.